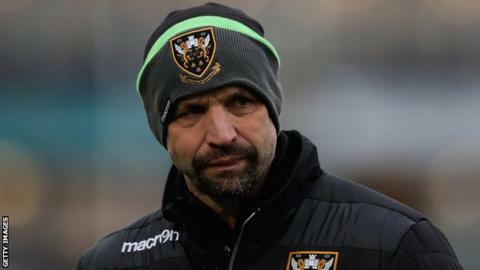 Northampton Saints chief executive Mark Darbon says there has already been a "lot of interest" in the vacancy at Franklin's Gardens as the club looks for a new director of rugby. Jim Mallinder was sacked on Tuesday with attack coach Alan Dickens placed in temporary charge. Darbon said the club could make an initial short-term appointment. "We're looking to bring in some interim coaching support but only if we can find the right person," said Darbon. "It's a fantastic opportunity and we've had a lot of interest already in the short time since we made the announcement." Mike Ford, the former director of rugby at Bath, has been linked with the post but Darbon said they would back the coaching staff currently in place, led by Dickens. "We're trying to put the right conditions in place for those guys to succeed," he told BBC Radio Northampton. "We're looking at the potential to bring someone in on an interim basis to support those existing resources. "Alan is a highly capable coach and his record is very strong. We all need to get behind Alan and the team to help move us forward." Darbon also said the "Saints family" of senior squad members and former players would be consulted on any new appointment. "We're lucky to have such a widespread and capable family that sits alongside this club," he said. "We'd be foolish not to solicit the opinion and perspective of our senior player group, ex-players and other members of the Saints family."